Raventools is a website offering software as service (SAAS) on a subscription basis including search engine optimization (SEO), pay-per-click (PPC) advertising on search engines and social media websites, social media monitoring, and analytics tools for marketers. The website also includes white papers they’ve created highlighting their experience or domain knowledge related to all of the above. Form and functionality are paired well with the Raventools website. Bold colors contrast with the stark white background to make sections or features of the site pop-out quite affectively. Design elements such as rolling buttons when the user scrolls over them gives it an extra bit of style. Overall, the site is easy to navigate and features its services well. 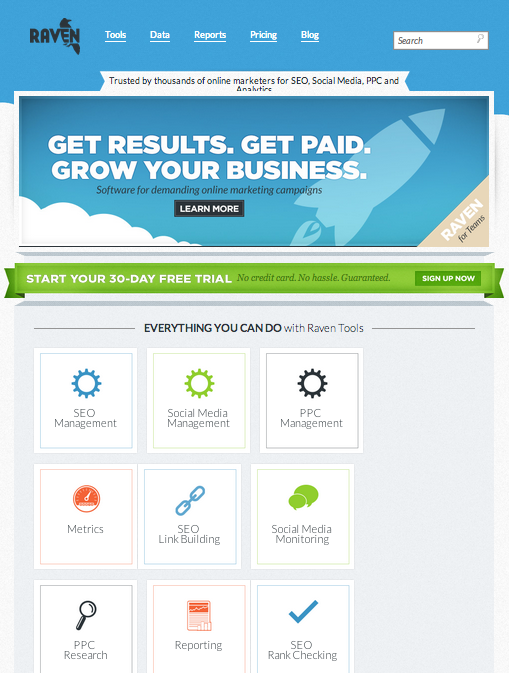 The banner at top tells the user immediately that Raven offers any service as a proof-of-concept with a 30-day free trial. 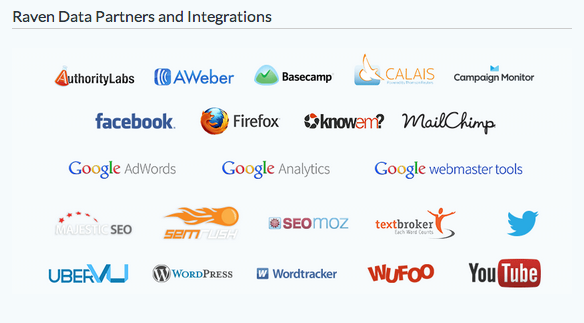 The website clearly states that Raventools is SAAS for online marketers and resellers of the service (as they reference “white-labeling” and resellers and affiliates regularly on the site) – obviously the target audience. The goal of the website is to “drive trial” of its 2 different levels of service. According to the pricing section, they again drive users to 30-day free trial of either service, and after trial, the user can sign up for either PRO ($99/mo, up to 4 users), or AGENCY ($249/mo, unlimited users) on a month to month basis.